Is there a correlation between social shares and inbound links? The question goes to the heart of why people share content and why they link to content. If people share and link to content for similar reasons then logically you would expect a very strong correlation between shares and links. However, if people share and link for different reasons you would expect to see variations in the correlation for different types of content. Why does this matter? Understanding why people share and link to content is eessential for both content marketers and SEO teams. Ideally we want to create content that is amplified through both shares and links. My analysis of 10,000 posts suggests that some forms of content are very unlikely to acquire both shares and links. 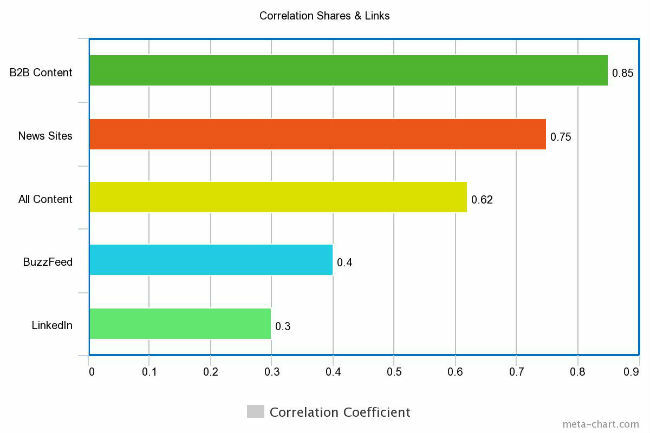 The analysis suggests at an overall level the reasons for sharing and linking to content are similar. However, the lower correlations and lower ratio of links for content such as quizzes and for list posts published on sites such as BuzzFeed suggest there are differences. There appear to be some forms of content that people are willing to share but which are less likely to acquire links. The analysis suggests that content such as B2B evergreen content is more likely to acquire links as well as shares, which is reflected in a high correlation of shares and links. Thus if you want to create content that gets both shares and links the analysis suggests you should avoid content such as quizzes and simple list posts and focus on longer evergreen content that has more intrinsic value. I would stress that this is an hypothesis which I am putting forward as the basis for further discussion, debate and research. My data set for this initial research was quite small at 10,000 posts and more extensive research exercise needs to be undertaken with larger data sets with agreed definitions of backlinks and social shares, clearly defined categories of content and data on the acquisition of shares and links over time. Full details on the data I used and my approach is set out at the end of this post. Previous studies have suggested there is a positive correlation between shares and links, such as this analysis published on Moz. My random sample of 10,000 posts found an overall positive correlation of 0.62 which indicates a fairly strong correlation between shares and links. This was slightly greater than the previous studies have found though I should say again that the data set I used was relatively small. However, it does suggest there are similar reasons for sharing and linking to content at an aggregate level. When I created sub-sets of data I found quite significant variations. For data sets of articles on news sites such as the New York Times, The Guardian and Huffington Post I found stronger correlations of up to 0.8. The correlation increased even further when I created sub-sets of data of articles from B2B sites to almost 0.9. By contrast when I created data sets for content published on sites such as LinkedIn and BuzzFeed there was a much weaker correlation (as low as 0.3) and a very low number of links to shares. I also found low correlations when I created data sets for specific content types such as quizzes. Why the differences you ask? Glad you’re as curious as I am, because it does matter. After all, if you’re aiming to drive shares and links to your site, you need to know what content to produce. Intuitively it would seem to me that some variation is to be expected as some content is better suited to being shared socially than to acquiring links. This goes to the heart of why people share content and why people link to content. Whilst there may be similarities I suspect there are also differences. For example, are people as likely to link to entertaining content as they are to share it? Fundamentally, are there some content types that are more likely to be shared than linked to? My instinct is the content which people link to has some intrinsic value. It also seems to me that content which can be considered evergreen is also more likely to continue to acquire links over time. Other content forms may have a smaller window to acquire links. My instincts may be wrong but the initial analysis would lend some support for these assumptions. Let’s look in a bit more detail. There is a strong linear relationship between shares and links on both news sites and B2B marketing sites. However, the average number of shares to links on large news sites is considerably higher as you would expect. 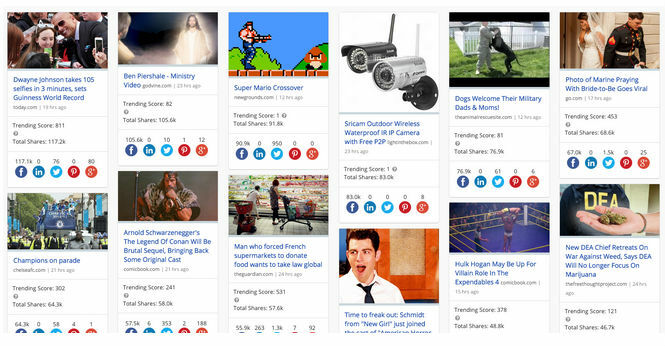 In my research I found news sites could get between 2,000 and 3,000 shares per quality link acquired. By comparison B2B sites, even larger ones such as Moz, typically got between 120 and 280 shares per quality link acquired. In both cases there was a very strong correlation with a coefficient of up to 0.8 for news sites and remarkably up to 0.9 even for B2B content. Thus there was a very strong relationship, to the point where I could predict the likely number of links with some ballpark reliability for some B2B sites based simply on the number of shares a post had received. Thus whilst quizzes often go viral in terms of shares they can achieve far less links. Here are three example quizzes from BuzzFeed which received nearly 400k shares but zero links. I found this pattern with all of the top shared quizzes though they didn’t all get zero shares. For example, the most shared quiz last year on Playbuzz (What color is your personality?) received 2.5m social shares and acquired 8 links. That is 1 link for every 300,000 shares. Clearly not all quizzes are the same. Some quizzes can have intrinsic value where they provide business or personal insights. This quiz (Are you a better manager or leader?) received 8 links and 6,000 shares. Similarly this Moz quiz (How much do you know about local SEO?) received a similar level of links to shares as other Moz content. It received 17 links and 3,800 shares, 223 shares per link. I suspect the degree to which a quiz is linked to will depend upon the extent of its intrinsic value. Playful quizzes such as “Which type of Star Wars leader are you?” will receive less links relatively but may be well shared. B2B quizzes that have diagnostic, actionable outcomes (e.g. How good a content marketer are you?) are more likely to earn links as industry bodies, agencies and other B2B entities are more likely to link to them. Thus while quizzes may help you generate viral views and engagement, they may be less valuable in helping you to acquire links unless they provide intrinsic value. It appears from my initial analysis that content published on LinkedIn and BuzzFeed gets relatively few links compared to shares and the correlation is weaker. The big caveat here is that the sample sizes of my sub-sets of data were quite small at just a few hundred posts for each site. When I get more time I would like to create much larger overall data set and corresponding subsets of data. However, the correlation coefficient fell to 0.4 for BuzzFeed content and 0.3 for LinkedIn content. Here are three random examples of LinkedIn posts which demonstrate the relatively low level of links to shares. These next two LinkedIn articles by influencers Richard Branson and Jack Welch may be outliers but despite acquiring over 25,000 shares they achieved zero links. Overall, I did find a positive correlation of +0.3 for LinkedIn content but in many cases the number of links were actually zero. My findings were very similar when I looked at a limited data set of Buzzfeed posts. Here are some examples. Despite a very low ratio of links to shares there was still a positive correlation of +0.4. I think in the case of BuzzFeed content one could argue that much of the content has entertainment value and is highly shareable but has less intrinsic long term value which would help generate links. This argument applies less to LinkedIn content so there may be other factors at play that explain the relatively low links of LinkedIn content. It would be great to get your views on this. Shares can happen very fast, much faster than links. A post can receive over 50,000 shares in a day but is very unlikely to acquire a large volume of links as quickly. 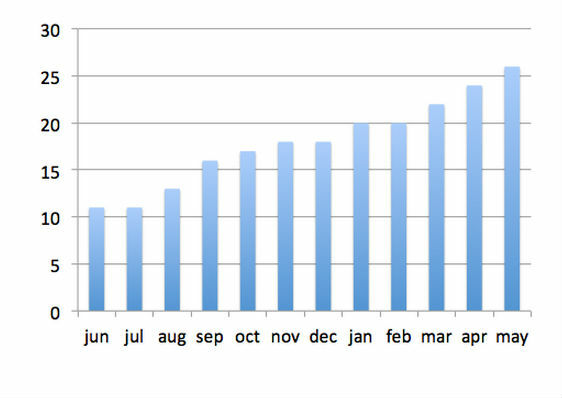 Below is a typical profile of link acquisition by an article over time. The post acquires 50% of its links in the first month. After that initial burst, it tapers off though further links are acquired over the following 4 or 5 months and few new links after this. I specifically looked at what I considered to be ‘evergreen’ articles and found a slightly different pattern of link acquisition over time. 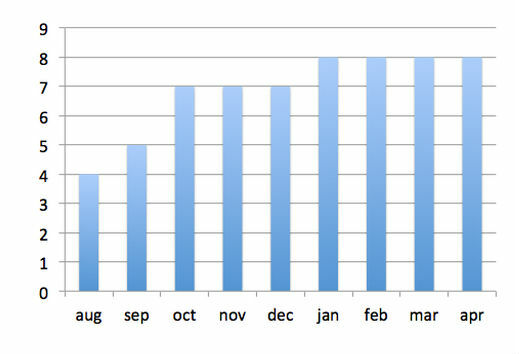 In the example below 40% of links were acquired in month one but links continued to be acquired slowly but consistently over the next 11 months. The profile of social shares over time tends to be different, the majorty of shares take in the first few days. Below are two examples generated using Zuum’s social analytics tool. 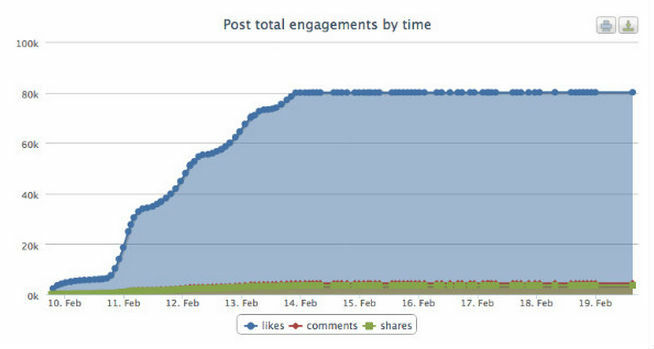 The first below shows a typical profile of likes and shares from Facebook over time. The second chart below shows a slightly different profile where the post has been boosted over 3 days. In both cases though the majority of social interactions still take place within 5 days. The speed with which content can attract social shares and interactions is shown by a glance at our BuzzSumo Trending dashboard. Below is the current dashboard as I write this post. The top posts today have already amassed over 50,000 shares and in two cases over 100,000 shares. My instinct, supported by the data above, is that shares take place much faster than links are acquired. Thus they are important in helping content to gain initial traction and to build awareness of the content. The purpose of this post is not to provide definitive answers around the relationship between shares and links but to provoke some discussion and debate. For content marketers the initial analysis suggests that to create content that gets both shares and links you should probably avoid content such as quizzes and simple list news posts and focus more on evergreen content where links will continue to build over time. The answers to these questions may help us better understand why people share content, why people link to content and the differences between the two. This understanding will help us improve our performance as content marketers and SEO teams. counted total shares across the 5 main networks. included all interactions on Facebook eg likes, shares and comments, though you could make an argument for just looking at shares. only counted links from root domains, thus if a piece of content received say 4 links from one root domain, I counted this as one link. only counted quality links. I ignored links from scraper sites and any links from web pages that had received zero shares. I made a presumption that if an article or web page did not have a single share it was a low quality link. I accept this is a very crude measure and it may be better to use say Moz’s page authority to grade links. I also created subsets of the data. I used categories of content type as defined by BuzzSumo and subsets for specific sites such as B2B sites, news sites, LinkedIn and Buzzfeed. If the data subset was below 250 I pulled additional content at random to add to these subsets of data. I recognise these subsets of data are very small and further larger sets need to be used to verify and test the findings. I used the BuzzSumo date stamps to analyse when links were acquired and the profile of link acquisition over time. For my analysis I used the Pearson correlation coefficient which looks at the statistical relationship between two sets of data. Correlation does not mean causation but it can be useful to understand any relationship and generate insights that can be used or exploited by marketers. The coefficient can range from +1 in the case of a perfect direct (increasing) linear relationship (correlation), −1 in the case of a perfect decreasing (inverse) linear relationship. It may also be useful in future analysis to look at Spearman’s rank correlation coefficient as this measures the extent to which, as one variable increases, the other variable also tends to increase, but doesn’t require a linear relationship. 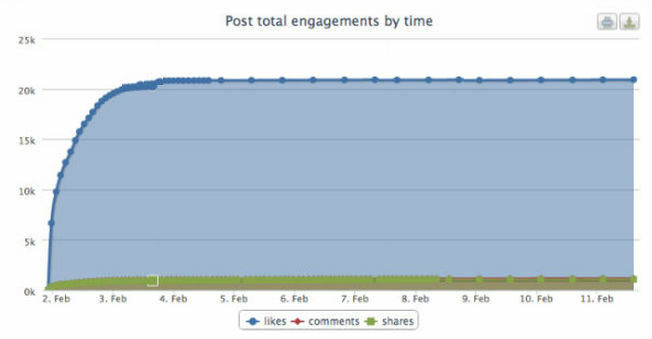 This may be helpful if we can see for example that as backlinks rise the number of shares also rise. Steve this is fantastic! While the correlation of social shares to links has been known for a while, you gave us valuable insights I haven’t seen anywhere else. As far as why LinkedIn posts get few links even when heavily shared…my speculation would be that people outside LI don’t view LinkedIn Publisher posts as real content. I’m betting they see them as social media posts, even though their longer form. I’ve seen the same thing on Google+, where you can right a longform, very authoritative piece, that gets lots of shares, but very few sites will link to it. I’m surprised by the LinkedIn stats. I’m leaning towards @trappermark:disqus on this one. The publishing platform is still young and users are still unfamiliar with the medium. It feels weird to deep link into a social network. The (linking) user has a lot of questions…Will someone have to be logged in to read this? What about all these weird parameters that appear in the URL? etc. etc. I speculate that as Google starts indexing more LinkedIn articles and we start discovering them organically, we will also see an increase in linking behavior. Some very nice data here, though I think the assumption that people share and link for the same reason is flawed. That’s actually revealed based on your research. Getting shares as a raw number is relatively meaningless if the content isn’t strong enough to persuade creators to reference and link to it in their own content. This is also the intrinsic reason why shares happen vastly faster than links. Shares are low friction events, they fall within the 9% of the 90-9-1 participation inequality principle. So you get a lot of them. Links on the other hand are high friction events and fall into the 1% bucket. Shares get you in the game, the content is the difference between a 3 and out and a touchdown. 1) I am wondering if the length of content affects shares, which can also affect links. For example, notice how widely the Humans of New York posts get shared, and they are usually very thin content. They also use visuals, always, and I wonder if that plays a part in here that hasn’t been calculated. And another thing is – where does the content get posted in its ‘original’ format. Humans of New York posts on Tumblr and Facebook – both of which are social sites encouraging social shares. 3) With the above two in mind, I guess content types (i.e. photo, video, gifs, writing etc.) also should be considered, not just the type of site? 4) Some of the big news sites syndicate articles from around the web as a “you may also be interested in” section. If an article appears on those side-bar and bottom-of-the-article posts, that would inevitably result in more shares and links. But do those count as shares, or as links? I fully agree that this argument applies less to LinkedIn content so there may be other factors at play.